Cooper Union for the Advancement of Science and Art received a A+. Washington Monthly's ranking of 96 out of 224 of Affordable Elite Colleges - Overall Rank was a major contributor to this grade. No longer able to afford its tuition-free deal for all students but still generous to those with demonstrated need, the Cooper Union for the Advancement of Science and Art continues to offer outstanding candidates a superb education in art, architecture and engineering. The setting is urban as only the East Village of New York can be, with the Bowery feeding into Cooper Square and McSorley's Old Ale House of "We were here before you were born" (i.e. 1854) fame just down the block. Abraham Lincoln gave the speech that made him famous in the East here. Cooper Union is that profound a place. What is a typical Cooper Union for the Advancement of Science and Art student like? Describe the type of person that should attend Cooper Union for the Advancement of Science and Art. Someone that is motivated and a dreamer. However, students at the Cooper Union must be hard workers to accomplish their goals. What are the top 3 reasons someone should attend Cooper Union for the Advancement of Science and Art? If they intend to be challenged by themselves, as well as others. If they want to enrich their lives through artistic development. If they want to have a promising future. What was a typical Cooper Union for the Advancement of Science and Art student like in high school? Describe the type of person that should attend Cooper Union for the Advancement of Science and Art. If you manage to get accepted into this technical institute, you get a full-tuition scholarship. The institution is unique among its peers in that every admitted student is granted full tuition scholarship for all four years. Not only do students need to have top academic accomplishments, but they also need to be a good fit. The Cooper Union for the Advancement of Science and Art, established in 1859, is among the nation's oldest and most distinguished institutions of higher learning. The organization, the legacy of Peter Cooper, occupies a special place in the cultural fabric of American life. Founded by industrialist, inventor and philanthropist Peter Cooper, Cooper Union houses schools of art, architecture and engineering, as well as a world-class faculty of humanities and social sciences. What are the top 3 things that students do for fun at Cooper Union for the Advancement of Science and Art? Campus housing is available for undergraduates. Housing deposit : $500.00. Housing deposit due : Jun 1. Housing deposit is refundable in full if student does not enroll.. Freshman allowed to have car. No pets. The average student pays $17,263 for tuition, fees, and other expenses, after grants and scholarships. Total stated tuition is $39,600, in-state and on-campus, before financial aid. Learn more about financial aid at http://cooper.edu/admissions/financial-aid. Estimate the net price for you at http://cooper.edu/admissions/financial-aid/net-price-calculator. The typical (median) early career salary of Cooper Union for the Advancement of Science and Art graduates is $61,400, according to Payscale. 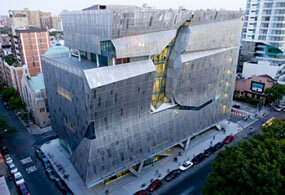 Want more info about Cooper Union for the Advancement of Science and Art? Get free advice from education experts and Noodle community members. What does your GPA have to be to apply here? Hello there! Cooper Union looks at students as a whole when they apply. Having a certain GPA does not guarantee whether you get in or not. What's the size of this entire college? There were 904 students enrolled in the undergraduate program in 2012. Could I study here fo free?